Location of Rockville in Parke County, Indiana. 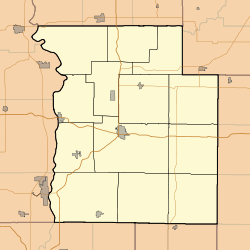 Rockville is a town in Adams Township, Parke County, in the U.S. state of Indiana. The population was 2,607 at the 2010 census. The town is the county seat of Parke County. It is known as "The Covered Bridge Capital of the World". Rockville was laid out in 1824, three years after the county was founded, and became the county seat. In 1825, its population was between 500 and 600. The residents voted to incorporate the town in July 1854. The Rockville Chautauqua Pavilion and Rockville Historic District are listed on the National Register of Historic Places. Rockville is located at the intersection of U.S. Route 36 and U.S. Route 41, about 30 miles (48 km) southwest of Crawfordsville. According to the 2010 census, Rockville has a total area of 1.49 square miles (3.86 km2), all land. The climate in this area is characterized by hot, humid summers and generally mild to cool winters. According to the Köppen Climate Classification system, Rockville has a humid subtropical climate, abbreviated "Cfa" on climate maps. As of the census of 2010, there were 2,607 people, 1,212 households, and 679 families residing in the town. The population density was 1,749.7 inhabitants per square mile (675.6/km2). There were 1,394 housing units at an average density of 935.6 per square mile (361.2/km2). The racial makeup of the town was 98.7% White, 0.1% African American, 0.5% Native American, 0.2% Asian, 0.1% from other races, and 0.5% from two or more races. Hispanic or Latino of any race were 0.7% of the population. There were 1,212 households of which 24.6% had children under the age of 18 living with them, 39.9% were married couples living together, 12.8% had a female householder with no husband present, 3.3% had a male householder with no wife present, and 44.0% were non-families. 39.5% of all households were made up of individuals and 20.1% had someone living alone who was 65 years of age or older. The average household size was 2.14 and the average family size was 2.82. The median age in the town was 44.8 years. 20.9% of residents were under the age of 18; 8.1% were between the ages of 18 and 24; 21.2% were from 25 to 44; 27.4% were from 45 to 64; and 22.3% were 65 years of age or older. The gender makeup of the town was 46.8% male and 53.2% female. As of the census of 2000, there were 2,765 people, 1,286 households, and 735 families residing in the town. The population density was 1,924.4 people per square mile (741.4/km²). There were 1,390 housing units at an average density of 967.4 per square mile (372.7/km²). The racial makeup of the town was 98.16% White, 0.14% African American, 0.47% Native American, 0.29% Asian, 0.22% from other races, and 0.72% from two or more races. Hispanic or Latino of any race were 0.83% of the population. There were 1,286 households out of which 24.4% had children under the age of 18 living with them, 43.5% were married couples living together, 10.8% had a female householder with no husband present, and 42.8% were non-families. 39.4% of all households were made up of individuals and 23.0% had someone living alone who was 65 years of age or older. The average household size was 2.11 and the average family size was 2.82. In the town, the population was spread out with 21.5% under the age of 18, 6.9% from 18 to 24, 27.0% from 25 to 44, 20.9% from 45 to 64, and 23.7% who were 65 years of age or older. The median age was 42 years. For every 100 females, there were 81.1 males. For every 100 females age 18 and over, there were 77.0 males. The median income for a household in the town was $27,813, and the median income for a family was $36,066. Males had a median income of $30,909 versus $21,745 for females. The per capita income for the town was $18,431. About 14.8% of families and 15.4% of the population were below the poverty line, including 28.0% of those under age 18 and 9.7% of those age 65 or over. The town has a lending library, the Rockville Public Library. Rockville hosts the Parke County Covered Bridge Festival. Morris K. Jessup - UFO conspiracy theorist. Don Lash - Champion long-distance runner, settled in Rockville after retiring from a career in the Federal Bureau of Investigation. Mark L. De Motte - A Representative in the Forty-seventh US Congress. ^ "USGS detail on Rockville, Indiana". Retrieved 2007-10-04. ^ "Spanning Time: America's Covered Bridges | WTIU". www.indiana.edu. Retrieved 2019-01-30. ^ Bowen 1913, pp. 164–171. ^ "Indiana public library directory" (PDF). Indiana State Library. Retrieved 14 March 2018. History of Parke and Vermillion Counties Indiana. Indianapolis: B. F. Bowen and Company. 1913. pp. 25–225. Retrieved 2010-12-17. This page was last edited on 30 January 2019, at 20:25 (UTC).